The G20 INFINIUM features a true Class-A amp head with a 2 x ECC83 front-end and 2 x EL34 power stage. A masterfully crafted push-pull tube amp, the G20 provides sweetly-balanced harmonics and natural tube compression – resulting in the warm distortion and break-up you’ve come to appreciate from the vintage megaliths of yesteryear – only in a much more portable and attractive package. Years in the making, our INFINIUM Tube Life Multiplier Technology can extend the usable lifespan of your amplifier’s expensive power tubes by up to 20 times, saving you huge money and ensuring the integrity of your tone. How? This revolutionary circuit automatically and continuously monitors the performance of each output tube, and dynamically drives it towards the target operating point, for an evenly distributed load. INFINIUM also compensates for the effects of aging, automatically adjusting current levels to keep your tubes sounding as good as new – even when AC line voltages drop below nominal levels. Similar technology has been used for decades in all-wheel drive cars, where systems modulate the power going to each wheel to improve traction. Just consider INFINIUM Series amps “4-wheel drive” for your guitar. INFINIUM Series amps take all the guesswork out of tube replacement by illuminating an LED next to a tube that is reaching the end of its usable lifespan. And thanks to INFINIUM’s Auto-Bias design, you simply replace the indicated tube – without a trip to the repair shop, saving you even more money. Available exclusively from BUGERA, INFINIUM Tube Life Multiplier Technology is a major breakthrough in amplifier design and manufacture, providing incredible reliability for your stage performance and more consistent sound over the lifespan of your tubes. Since they are always operating at optimal levels, your output tubes perform more predictably and last much longer, thanks to BUGERA’s marvelous INFINIUM Technology, saving you some serious money! 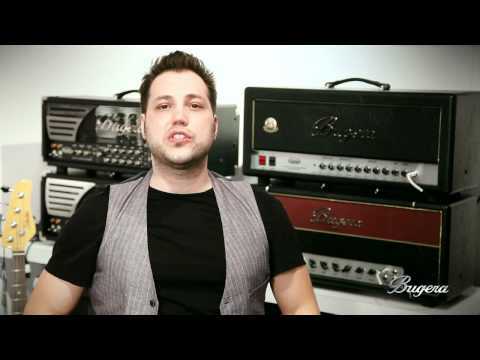 To learn more about how BUGERA’s INFINIUM Technology works to keep your tone strong and sweet, please watch this video. Our proprietary MORPH EQ control lets you instantly jump the Atlantic Ocean, to give your music either classic U.S. or British-style EQ tone – or anything in between! Why choose between two great sounds? The G20 INFINIUM gives you the best of both worlds, and all the subtle shades in between. Adding to its impressive list of tone-shaping options, the G20 INFINIUM’s high-definition Reverb puts the perfect finishing touch on your signature sound. Adjustable via the dedicated front panel control, you can finally achieve any sound you desire – from a subtle touch to the cavernous, natural-sounding reverberation of a large arena. The G20 INFINIUM cranks out the most beautiful 20 Watts of Class-A, tube-fueled tone, giving you everything from sweet and sassy to maximum tube saturation. But sometimes you need to keep the volume down, such as when you’re practicing a home late at night. For those occasions, the G20 has you covered with an incredible speaker-emulated headphone output that gives you the vibe and sound of your choice, a 1 x 12 or 4 x 12 cabinet – it’s all up to you with a flick of a single switch. Plus, the rear-panel Line Input allows you to jam along with your favorite backing tracks. Long life and impressive durability are ensured, thanks to the high-quality components and exceptionally rugged construction found throughout. Designed and Engineered by BUGERA Germany and featuring our 3-Year Limited Warranty Program, the BUGERA G20 INFINIUM gives you all the vintage, modern, British and American tones of the most revered tube amps, pairing the vintage Class-A circuit design with our INFINIUM Technology, a built-in Power Attenuator, an FX Loop and many other modern conveniences – making the G20 your new go-to amp! No matter what era or color of tube amplification you prefer, the G20 INFINIUM delivers amazing results every time. Head down to an authorized dealer today and crank one up!